February. To some, and Hallmark, it’s the month of love. I don’t hate the holiday that is in the month, but I think if you love someone you should show it every day and not just one special day of the year. My point is I wanted to write about an album that has a lot of love. I own many records on the subject, but one stands out the most. This “review” has been taking me about two months to write. I almost didn’t post it because I felt that it was too personal. When I say “review”, I think it is known that I talk about how these albums have affected my life. I can tell when, where, and how I was feeling when I purchased any album and then how they made me feel. These aren’t the typical album review. Anyway, I wasn’t going to post about this album, but after seeing the documentary Sound City in theatres I decided I should. Watching that documentary I saw many high named musicians spill out their guts on how music is such a big part of their lives. Someone watching it might think it was too nostalgic or emotional, but to me it was like minded people being able to relate to each other. It was fascinating and inspirational, and so much so that I said I will talk about this album in great detail. Might seem very personal, but that’s me. Also no one has ever heard me talk about my situation in this detail. A little background. I dated a girl, it is always a girl isn’t it, for three years in college. It was perfect. It was love. It was meant to be. Out of my 25 years of life, it was the best three years. Yet here I am writing about the one that got away. Not to go into too much detail, but we ended with unanswered questions. To this day I still don’t know what exactly made us end it. There was no cheating, fighting, or anything like that. It just ended. However, during the aftermath, three albums helped me get through it all. I Can Make A Mess Like Nobody’s Business The World We Know, We Shot The Moon A Silver Lining, and The Graduate Only Every Time. Hopefully my label will be able to put the first two out on vinyl when someone takes a chance on me. The Graduate album though, helped me remember how important she was and how I was feeling after the whole break up. Almost every song plays a key role in the aftermath, and that is impressive. Now, if you don’t know who The Graduate is, go listen and then come back to this. This band, like my relationship, ended too soon. This band should have been huge and playing arenas. Their music, lyrics, and vocals are by far the best in the industry. Sadly everything ends, but they left us with great music, and left me with amazing memories I’ll never forget. Only Every Time starts off the right way with a good drum intro. “Don’t Die Digging” has the typical Graduate sound, atmospheric guitars, sequencing, and the extra drumming that would’ve sounded phenomenal in arena setting. When I first heard this song, I feel in love with the opening lines. I related to it because after a break up like this, not having that person lying next to you is the worst feeling. The album progressively stays on target with the aggressiveness. “Siren” shows off the guitar work of the Graduate and the many techniques they are capable of doing. This song really does sound like Sirens singing to a helpless man. Another song where Corey’s lyrics help me realizes that I love this girl so much so that I will always will until the very end. Moving along, The Graduate slows it down with their first slower number in “Stuck (Inside My Head). If you know The Graduate, you know their slower songs are always the best songs, but this time they end it with multiple drums. I should post the entire lyrics to this song because when I heard it, I always remember thinking about the next day after a break up. The countless hours sitting in bed, the reminiscing, the isolation, etc, and thinking about it now sounds sad. Yet, once you get past that phase, weirdly enough, you start to miss. When everything around me is falling? When you are not around and I’m calling? “Pull Me In”. If I was Razor & Tie Record’s President, I would’ve called a meeting and said, “I am putting all our marketing money into this song. I want it in every romance and romantic comedy movie trailer and end credits. I want to hear it everywhere I go, because it is that damn good.” This song should have pushed The Graduate into stardom if marketed right. Even the music video was beautifully shot and made you want to be in love. Again, I will get personal, but when I get teary and goose bumps over a song, I know this is a band I won’t let go. When I heard this song I was blown away. The chorus has to be the best chorus I’ve ever heard. Also it just added to my break up. This song made me get up and go. It made me not sit around and feel sad. It made me realize that even though I didn’t have her anymore, I was going to do everything in her honor. From the pictures I take, to the people I helped in need, to becoming a better man, it is all for her. There is a little part of her in everything I do, which sounds weird, but once you know what love is, it is hard to leave it. She made me who I am today and helped me fall in love with the world. “Choke” is one of the personal songs for me. Anytime I hear it, it reminds me of the time that I went to Newport, Rhode Island with her. She was from the New England area, and she always went to the beach every summer. This was one of the few times I went with her. I remember holding her in the ocean and she said something like this all just feels right and perfect. I remember just smiling and feeling like this will never end. This song brings that moment back crystal clear, and it is true, being with her was the only time I felt alive. It was the only time that year I felt alive. Everyone knows who their first kiss was. Everyone also knows who their first love was. Only some remember exactly when they fell hard for someone. My story of that is kind of sad, but also happy. It was the end of my sophomore year and the end of her freshman year. I was leaving the campus before her because I finished my exams, but also I had to hop on a plane the next morning to fly to California to start tour. I still remember standing in the parking lot with her. At this point we were only dating for about five months, but we were in love. It was love at first sight I might add, something I never thought existed. We were saying our goodbyes, and she started to cry. At first I was confused, but then I was happy. At that moment I didn’t know what true love was. It is still hard to describe what true love is, but you will know when it happens and this was my moment. Knowing that we were going to be far away from each other for so long and the next time we would see each other is when the tour stopped in Boston was a sad thought. I knew right then and there that this girl cared about me more than words could describe. All I could do was smile and hold her tight knowing that someone will truly miss me. “Permanent Tourist” is almost an autobiography of that whole summer for me. The mood, tone, and lyrics of that song hit perfectly. It is hard to only pick certain lines, so unfortunately I am going to add all of them. Another personal song for me. Can’t believe it took so long to start. Got to find my way back somehow. If I make you that promise now. All the more that this is in my blood. Mine and yours, yours and mine. The last song I want to comment on is “End Of The World Delight”. This song is where I was after I tried to win her back. I tried so many things, and I had plenty more until everyone convinced me that it was time for her to miss me. I still hope I made the right decision. To be sure is asking for too much. Looking back on this review, I must sound pathetic, but it took a lot out of me to write. I never explained those personal stories before, but this album brings it out of me. Last I knew she has been dating a guy for a while. Who knows maybe one day she will read this and maybe one day we will talk again, wouldn’t that be a hoot if both happened haha. That’s how life is though, we never know what will happen next. Will I ever see her again? I don’t know. It is up to the Gods to make that call. If it happens it happens, but if someone else comes around then that’s how it was meant to be. I know this though, let it be her or someone else, I will always look at that person as if she was a present I have been waiting forever to open and in every moment I see her, she will be all that matters. 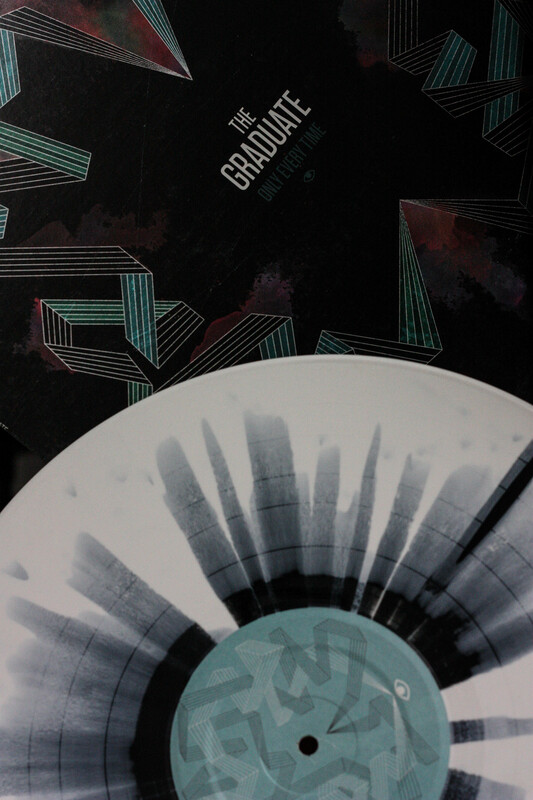 The first vinyl release from an Absolutepunk.net user. His label, American Dream Records, did an excellent job on this vinyl reissue which is now sold out. I can’t deny it, but I am jealous he is able to release vinyl. I love the variant of white with black splatter. For a while this was my favorite vinyl release. It came with a digital download and lyric sheet, which is a plus. Also has a bonus song, “Sea Legs”, which is a nice perk. This is how vinyl should be release, extra goodies. It’s funny how music makes us relate and have us reveal some of our secrets. This is why I love music, I love the feeling I get when I listen to an album. In this case it helps me remember memories I hope to never loose and remember of a time that meant so much to me.